Oxe FM Synth was published by DTM Magazine 2008 9. It was referenced on page 24 and the installer comes in the DVD vol 171, shipped with this edition. I’m glad to announce that Oxe FM Synth was published on Computer Music magazine. This special issue is about “The best free plug-ins ever!” and comes with a CD containing the softwares covered. My product have won almost a entire page as you can see in the image. Click here to buy the Computer Music Special 30. 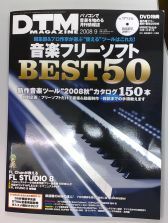 Oxe FM Synth was chosen to be part of DVD content of the japanese “DTM Magazine” (issue Jan-2007).